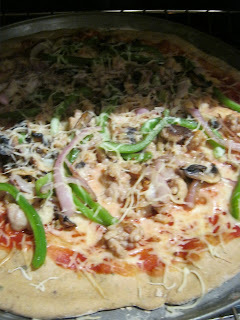 Citrus Catering & Events: The Foodie Blog: What's for dinner: Clean Pizza! We had this delicious CLEAN pizza for dinner last night. I was surprised by how yummy it was! It had all the works...onions, bell peppers, mushrooms and chicken sausage as well as a homemade Herb Infused Whole Wheat Crust. Stay tuned for the recipe! I will be posting all the details on Monday's with Michelle over at Makes me wanna Holler this coming Monday. Make sure you check it out!